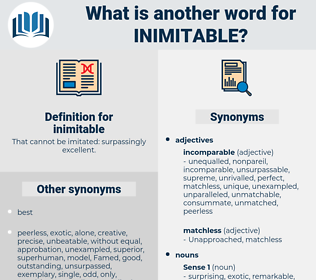 What is another word for inimitable? That cannot be imitated: surpassingly excellent. mediocre, consistent, dissatisfactory, garden, normal, bad, frequent, ill, ubiquitous, execrable, deficient, everyday, paltry, wretched, reproducible, unsatisfactory, low-grade, common, awful, pathetic, bush, inferior, depressed, terrible, low, lame, household, usual, ordinary, commonplace, routine, lousy, unacceptable, atrocious, lower, second-rate, vile, rotten, off, lesser, substandard, worst, poor, bush-league, punk, worse, wanting. The only thing that really struck us in these mountain girls was the elegance of their shape, and the inimitable grace of their bearing. With this inimitable farewell they vanished again from my view until months after this I ran across them, for the last time.